Imran Khan - Legend of cricketing world & Politician. Imran Khan reached the pinnacle of his cricket career when he led Pakistan team to victory in 1992 world cup. After having quite a notorious love life he married Jemima, a wealthy British National and eventually got divorced after having two sons. He is credited for constructing and raising funds for the first Cancer hospital in Pakistan where majority of patients are treated free of charge. Presently, he is involved in active politics and gaining much popularity and one of the potential candidates for the upcoming elections in 2013. Do his hands show any potential to be the cheif executive of Pakistan? Re: Imran Khan - Legend of cricketing world & Politician. Commensurate with his age there seems to be neither luck line nor sun line visible in his hands therefore there is remote posibility for him to reach to the pinnacle of power. However pakistan is known for miracles for reaching in the power corridors so miracle may help to make imposible into startling " possible "
Imran Khan must have retired from Cricket at the age of 35/36 when his fate line ends and also head line dims. pravin kumar wrote: Imran Khan must have retired from Cricket at the age of 35/36 when his fate line ends and also head line dims. Wrong.He was retired at the age of 40. 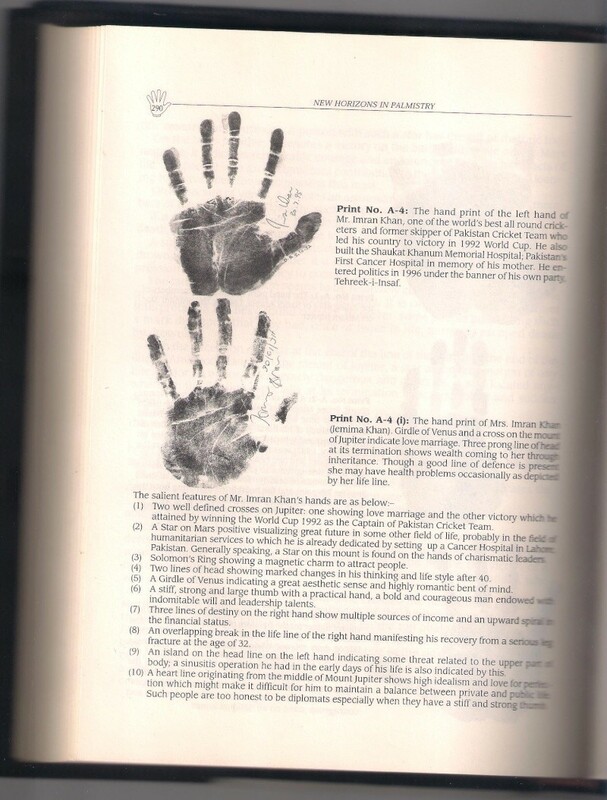 I took Imran Khan and his ex-wife Jemima hand prints from M.A Malik's New Horizon in Palmistry. Author also predicted on Imran and Jemima's Hand. nasir zuhrani wrote: Commensurate with his age there seems to be neither luck line nor sun line visible in his hands therefore there is remote posibility for him to reach to the pinnacle of power. However pakistan is known for miracles for reaching in the power corridors so miracle may help to make imposible into startling " possible "
Mr. Imran Khan has lost elections. The Modern Hand Reading Forum was featured yesterday at Pakistan's Awaz TV, where they talked about this topic. I am not sure yet what is communicated exactly inside the Pakistani TV-item... but so far it appears that the Pakistani people took Nasir Zuhrani's opinion about mister Imran Khan's very seriously. To me it looks quite like the Azaz TV staff has created a storm in teacup; actually, I wouldn't be surprised when there is some kind of political game acted out in the TV-item - because at this forum this topic about mister Imran Khan's hand had so far attracted not much attention at all!!! He recently got elected for prime minister ... didnt know his hand anaylsis would be here on this forum !